Eva O'Connor and Stephen Jones. MAZ AND BRICKS, the new play by Eva O’Connor, and staged by Fishamble: The New Play Company, will be performed in the Town Hall Theatre, as part of the 2018 Galway Theatre Festival. Two young people meet one day in Dublin. Maz is attending a Repeal the 8th demonstration, while Bricks is going to meet the mother of his young daughter. As the day unfolds, the two become unlikely friends, changing each other in ways they never thought possible. 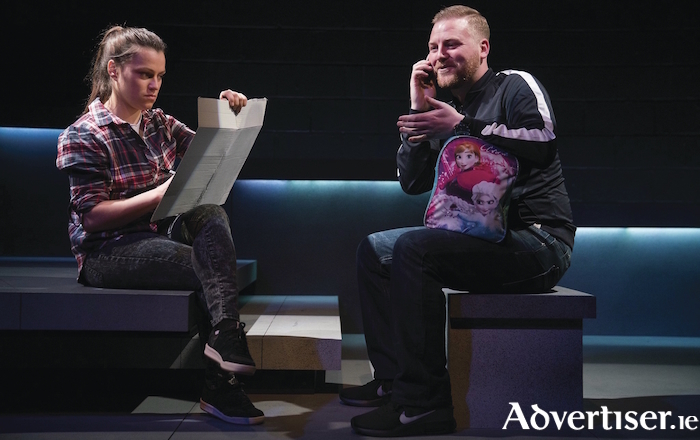 Directed by Jim Culleton, and starring Eva O'Connor and Stephen Jones, the play has met with considerable critical acclaim. The Sunday Independent called it, an "almost perfect and unmissable piece of deeply moving drama". The Sunday Business Post declared it "inspired" and "timely". The Phoenix said the "compelling backstories and identities" of the play's characters "make the play very watchable".